So, learning German is hard. Have you heard that before? Well I am here to tell you, it is in fact damn hard. 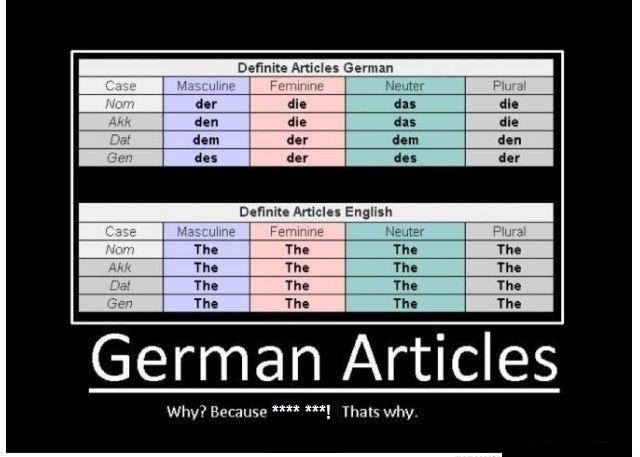 It’s so hard, the Germans actually have a saying for it: “Deutsche sprache, schwere sprache”, which word-for-word translated is “German language, difficult language”. See what I mean? Even Germans think German is hard! I’m not trying to complain, mind you. I really don’t have any room to. I am comfortable with German, very comfortable. I understand 95% of what I hear, and 98% of what I read. And I am actually a fairly fluent speaker, when it comes to everyday conversation anyway. In the beginning I was also told I was learning very quickly. So like I said, I am not trying to complain, much. But there is one part of the German language that I just can’t ever seem to get right. Articles. Definite articles. Indefinite articles. Articles, articles, articles! They are my curse, the bane of my existence, my kryptonite. And the problem is, as far as I can tell anyway, my German is not going to move to the next level until I learn them. Now if you’ve read my post “The Backstory”, you know that 90% of any German skills I posses are thanks to the best teacher on the planet (a.k.a. my beautiful wife) and any shortcomings I have are definitely not her fault. No, the fault lies solely with me. She spoke and I, like a typical guy, did not listen. My fatal mistake you see, was that with every word I learned I failed to memorize the corresponding article. But who needs articles anyway, right? Especially 16 different ones? I mean, English only has one and we do just fine. Why overcomplicate the matter? That many different ways to say “the” is just plain overkill. Do you want to know what really upsets me about articles though? It just so happens to also be the reason they are so hard to learn. Consistency. Or better put, inconsistency. You would think there would be some kind of rhyme or reason to these things, but no! All furniture uses “der”? No! All fruit uses “die”? No!! All animals use “das”? No!!! No system what-so-ever. To make matters worse, some things actually have more than one article. For example, my car is called “das Auto” aaaaand “der Mercedes”. For another, I am sitting on “die Couch” oooor “das Sofa”, depending on your preference. And you don’t want to get me started about how “die Couch” turns into “der Couch”, simply because I am sitting on it. Are you kidding me?!?! Who exactly made all these decisions? Apparently this mysterious person woke up one day and thought, “today I am going to make the German language as hard as humanly possible”! So what’s the end of my little tale? I have a (semi)expansive German vocabulary, but a totally non-expansive collection of articles to go along with it. And the lesson to be learned from my little rant? Always, always, always learn the article with the word. Always. And eat your breakfast. It’s the most important meal of the day! Sounds hard! My Latvian and Russian students have a similar time with English articles as they don’t have them in either language. So they use a instead of the, the instead of a, an instead of a… if there’s a wrong way to use them, they find it!! To us, it’s so obvious but to them, they’re a total mystery! I had no idea that English is actually so hard to learn. FANTASTIC article. I love it. I love this post! I have written two about my struggles to learn German and they are some of my most popular. Thank you for summing up my frustrations so perfectly! (My husband was raised by German immigrant parents in America so he grew up speaking Denglish!) Kudos to your wife for teaching you. My husband grew up fluently so he doesn’t really know where to start. Keep up the learning and the good writing! Ha, I laughed as I read through this post. I know exactly what you mean. What drives me crazy is if you don’t know the original article for the word, when the case changes you will mess that up as well! It’s just a mess. For example, if you didn’t know that the article for “Apotheke” is “die” and instead think it is “der” you would say “der Apotheke” and if you were wanting to tell your wife you were going to the pharmacy you would say, “ich gehe zum Apotheke” when it actually should be “ich gehe zur Apotheke” because it’s “die”! Die becomes der for whatever absolutely insane reason!! I know, I know, I feel your pain. I hate that sometimes not knowing the article throws off your entire sentence. I would guess that our language skills are pretty much on the same level but those articles sometimes make it seem like you can’t speak the language fluently at all when you are doing the whole “aritcle shuffle” mid-sentence and sound like a fool “mit dem, mit der, mit I don’t know”… 🙂 Luckily, I also have a wonderful German wife who loves to guide me through the tortures of the German language, haha. Great post! Good to hear from someone in the same boat as me!